Buckle up: we’re still in Ethiopia, and this post promises to be just as long as the last. We arrived in Lalibela wrecked from our trek in the Simiens, but did our best to perk up with a fresh mango smoothie before heading to tour some of the famous rock churches. To be honest, that first day a lot of the information our sweet guide shared with us went over my head, but even in my groggy state it was impossible not to be impressed. The churches date back to the 11th century and are dug straight into massive chunks of basalt, modeled after Jerusalem in order to save the country’s Orthodox Christians the arduous pilgrimage. Pilgrims shrouded in white circumambulated each carved monolithic church, bending down with effort to kiss the steps of each entrance. The insides were equally impressive, with intricately carved stone pillars and frescos covering the walls. We ended our first day as the sun set at St. George’s, a massive Orthodox cross cut into the earth, seen in every Ethiopia tourism brochure. That night we had dinner with some new friends at Ben Abeba, a kooky hilltop restaurant, where after a local gin and lemonade the owner let us play with their rescued baby klipspringers, and now I can die happy. This little darlin’ came to keep me company while I was manning a checkpoint at an ultramarathon event we hosted. Flights are purchased, plans have been sorted, and in seven short days my time working in Oman will come to an end. These past six months have felt long, with far too much time spent feeling isolated and lonely, as well as dissatisfied with/ uninspired by my job. In these final few days I wish I had a tidy life lesson to write down, something about the value of persevering through unhappiness perhaps, but mostly I’m just glad this phase is over, and I’m trying to find the silver linings from this experience where I can. Oh man, Oman- my week spent roaming around greater Oman was pretty much the bee’s knees. A few days after celebrating a still surprisingly festive expat Christmas, Gary and I made a beeline down the Gulf Coast, eventually crossing the border into mainland Oman and continuing south. To help pass the time we counted wild camels and donkeys along the way, pulling over after a long day of driving to set up our tent on a cliff above the ocean, where we watched the sunset and spent the night playing cards by the fire, listening to the waves crashing below us. The next morning the drive further south looked remarkably like the coastline in Southern California, until we crossed the Tropic of Cancer and big mountains etched out by deep canyons began rising up next to the sea. Our first stop was to explore the ruins in Qalhat, a tiny coastal town written about in its heyday by Marco Polo. We tried to imagine former splendor as we poked about Bibi Maryam’s tomb and an old graveyard before continuing inland towards Wadi Bani Khalid. 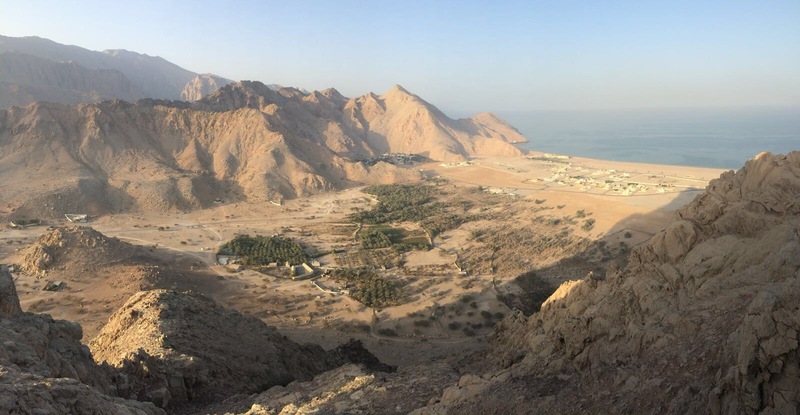 Dibba, which I’ve also seen written as Daba, Dabba, Dibya, Dabya and Doba, has helped me redefine just how sleepy a little town can be. Living here has felt a bit like stepping back in time, life following the simplicity of the desert landscape. There are quite possibly more goats than people, roaming about town wherever they please, and you’ll also find the occasional wild donkey milling about, left over from days when they were expected to haul in fishing nets. Superstitions still abound, so far I’ve heard not to photograph the goats or they won’t produce milk, not to kayak off the main beach because it scares the fish away, and to only eat dates in odd numbers if you want any of the nutritional benefits.